Summary: When Paul and John Mark had a falling out, the dispute was so sharp that each man took a new assistant and traveled in a different direction; Barnabas took Mark and sailed to Cyprus, and Paul chose Silas and departed for Cilicia. In Matthew 18:15-20, Jesus gave His procedure for dealing with people problems that arise within a church. There is no perfect church, because there are no perfect people. I heard a man say one time, “I wouldn’t belong to any church that would have me as a member. We are far from perfect, that’s why conflict is inevitable in the personal relationships between Christians. It is humanly impossible to live in total harmony with others all the time. Jesus told His disciples how to settle disputes between believers in Matthew 18. But first, I want you to see what happened when Paul and John Mark had a falling out. In Acts 15 we are told how Paul resolved his conflict with John Mark, which had developed between Paul’s first and second missionary journeys. Listen as I read verses 36-41. 37 And Barnabas wanted to take with them John called Mark. 38 But Paul thought best not to take with them one who had withdrawn from them in Pamphylia, and had not gone with them to the work. 40 but Paul chose Silas and departed, being commended by the brethren to the grace of the Lord. We are told here that after some time passed (the amount of time is not clear), Paul expressed to Barnabas the idea of returning to the cities where they had established churches. The disagreement over John, whose family name was Mark caused the splitting up of the first missionary team. Paul objected to taking Mark, who had left them in the city of Pamphylia. The dispute was so sharp that each man took a new assistant and traveled in a different direction; Barnabas took Mark and sailed to Cyprus, and Paul chose Silas and departed for Cilicia. We are not told how long it took, but eventually Paul and Mark were able to overcome their differences. Later, when Paul wrote to the Colossians and young Timothy, he mentioned Mark and said that he appreciated him. He told the Colossians, “Aristarchus my fellow prisoner greets you, with Mark the cousin of Barnabas (about whom you received instructions: if he comes to you, welcome him),” and to Timothy he said; “Only Luke is with me. Get Mark and bring him with you, for he is useful to me for ministry.” It’s evident from this that Paul had forgiven Mark and wanted his company. I think that Paul understood that holding a grudge would hurt him in the long run. He must have taken steps to repair the damage, and they became good friends again. Allow me to digress for a few minutes. The apostle John warned Christians not to hate each other, when he said, “If a man say, I love God, and hateth his brother, he is a liar: for he that loveth not his brother whom he hath seen, how can he love God whom he hath not seen? And this commandment have we from him, That he who loveth God love his brother also” (1 John 4:20, 21). I didn’t say this; John did. John says that if you say you love God and hate your brother, you are a liar. “For he that loveth not his brother whom he hath seen, how can he love God whom he hath not seen?” There is a great deal of nonsense and pious hypocrisy going on today, even in our fundamental churches. If we do not love our brother, then we do not love God either. Notice that this is a commandment. God does not ask you if you feel like it or if you want to. He says, “This is what I command you. Because I love, you are to love.” I get a little tired of hearing some Christians say they are “dedicated” to God when they are lazy on the job. You are not dedicated to the Lord unless you demonstrate it in your life and in your service. 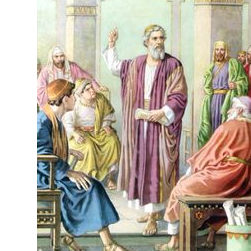 Now, let’s look closely at what Jesus said about resolving conflicts. The Christian is to be a truthful person. “Tell him his fault,” means to be honest with him about his fault. But we don’t want to hurt anyone so Paul says in Ephesians that we are to “Speak the truth in love” (Eph. 4:15). That is the secret of maintaining Christian fellowship. But, don’t wait too long before dealing with the problem, because the longer we wait, the more people we involve in the problem. When Paul and John Mark had a falling out, the dispute was so sharp that each man took a new assistant and traveled in a different direction; Barnabas took Mark and sailed to Cyprus, and Paul chose Silas and departed for Cilicia.